The Spirit Esprit ET388 folding treadmill offers many of the same features and design as its bigger brothers, the ET488 and ET588, just in a budget package. The Spirit Esprit ET388 folding treadmill has a large blue backlit LCD display showing distance, speed, incline, and more. Among its user-friendly features are handlebar-mounted controls that allow the walker easy access to change speed and incline. UPDATE: The Spirit ET388 treadmill has been discontinued and is no longer available for sale. You can compare the latest models here to decide which one is right for you. The Spirit Esprit ET388 treadmill has a 2.25 hp continuous duty motor, steel frame, 2.3" rollers, and a 1.5-ply Duraweave belt on a 1" thick phenolic deck. It has a soft drop assist folding mechanism, plus an integrated 4-wheel carriage for easier transport. 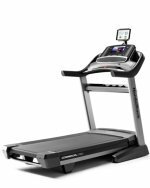 Even with a belt speed up to 10 mph, and a 10-degree incline, this treadmill is designed for light duty and should not be the choice of users over 250 pounds. It will be fine for light jogging but it isn’t a rugged machine for race training. 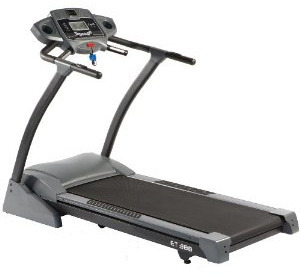 Treadmill reviews tout the ET388 as a basic treadmill with an average motor and cushioning, and below average warranty. Though these machines are made by the same company that makes Spirit and Sole treadmills, and the Esprits share the same design and many like components, this is the cheap economy brand from Dyaco. Judging the Spirit Esprit ET388 at its $1,299 MSRP, it gets a yellow light. There are at least a dozen folding treadmills that offer more power, longer decks, expanded programs, and better warranties as well as cool extras. 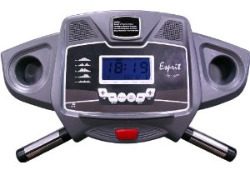 That being said, this model often sells for as low as $899 at Amazon.com, which is $100 lower than the ET288 at $999, making it a better value, yet the Spirit Esprit ET388 folding treadmill still fails in head-to-head comparisons with other models. If you are in the market for a solid folding treadmill with similar specs and design, but with better value, check out the Sole F63 treadmill at $999.